You hear it in movies, TV shows, among your friends and you probably say it yourself: "I Googled her before I called her." "I know because I Googled it." "What's the temperature in Fargo? Google it!" But Google wants you — and the world — to stop using Google as a verb for looking up anything on the Internet — unless you actually used Google's search engine to do so. Google's laser focus on how its name is used even extends to Sweden, where the country's Language Council recently wanted to add the word "ungoogleable" to a list of new words as meaning something that can't be found on the Web using a search engine. Note: a search engine — not necessarily Google's. Google objected, according to the Associated Press, "asking for changes showing the expression specifically refers to Google searches and a disclaimer saying Google is a registered trademark, the council said Tuesday." The group expressed its "displeasure with Google's attempts to control the language." Google told NBC News Tuesday it did not ask the council to remove the word, but only wanted some editing of the definition. With Google as the leading search engine, there's little doubt that we mean Google when we say we Googled something. As comedian Ellen DeGeneres said on her show, talking about technology's impact on our lives, "If you need to know something immediately, you can Google it now .... Ten years ago, if you said you were going to 'Google' someone, you got written up by Human Resources." So, what's so bad about using "Google" as a verb for saying you looked up information on the Internet? Ironically, because of Google's "significant brand recognition," the company "has started down the path of becoming synonymous with search engine services and, accordingly, towards the genericization of a trademark," wrote attorney Matthew Swyers, founder of a law firm specializing in trademark rights, in an article for Inc. last year. And becoming generic is bad because it threatens a company's legal right to a trademark. "Aspirin was originally a trademark of Bayer AG," Swyers wrote. "Escalator was originally a trademark of the Otis Elevator Company. Even the word Zipper, at one time, was a trademark owned by B.F. Goodrich. Now, because of their respective fame and genericization, they merely refer to classes of products we see every day and do not identify the source of those goods." A trademark is a word, name, symbol or device that identifies a particular company's products or services. Google is a trademark identifying Google Inc. and our search technology and services. While we're pleased that so many people think of us when they think of searching the web, let's face it, we do have a brand to protect, so we'd like to make clear that you should please only use "Google" when you’re actually referring to Google Inc. and our services. Kory Stamper, associate editor of Merriam-Webster, Inc., told NBC News that the verb "google," as well as "Google" was first added to the Merriam-Webster's Collegiate Dictionary, Eleventh Edition, and to its online dictionary in 2006, "based entirely on its use in edited English prose." The Merriam-Webster definition of "google" (lowercase or capitalized), "googled" and "googling" is this: "to use the Google search engine to obtain information about (as a person) on the World Wide Web." 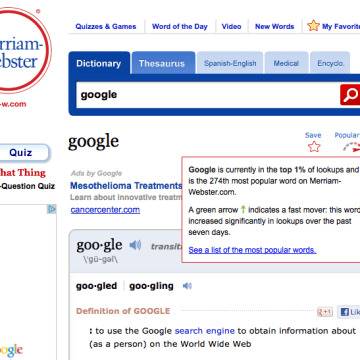 Merriam-Webster's online dictionary definition of "Google." There are three criteria for a word making it into the Merriam-Webster dictionary, she said: Widespread usage of a word, "sustained use" and "meaningful use." 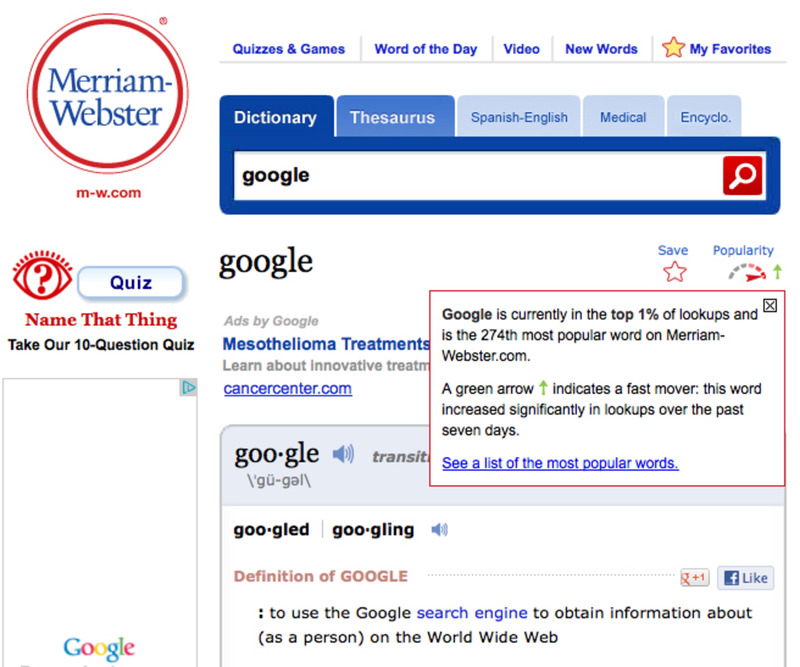 "By the time we did the copyright printing of the Collegiate Dictionary for 2006, we had enough evidence in our files to show that the verb 'google' had met all three criteria for entry," Stamper said, adding: "It's worth noting that the verb 'google' dates back to at least 1998, according to recent information we've gathered." Despite what happened in Sweden, Google says it's not stepping up, but rather just continuing, its ongoing efforts to patrol its trademark. "While Google, like many businesses, takes routine steps to protect our trademarks, we are pleased that users connect the Google name with great search results," a company spokesperson said in a statement to NBC News Tuesday. And, perhaps as NBC News' own Internet expert Helen A.S. Popkin noted, "Google as a verb is brand awareness. When Willow used 'google' as a verb on 'Buffy the Vampire Slayer,' everyone knew Lycos and Jeeves and Yahoo were cooked." Check out Technology, GadgetBox, TODAY Tech and In-Game on Facebook, and on Twitter, follow Suzanne Choney.